Together Focus and FWISD found success in just 8 short months! From the initial kickoff meeting to the Go-Live date, Focus School Software knew there was much to accomplish in a short time frame. Focus began by meeting with district stakeholders and Specialty Groups to build a project plan around the Gap Analysis and gather all the requirements needed to implement a system very finely-tuned to the district’s curricular and data needs. Focus worked with these Specialty Groups in a classroom setting to discuss data needs, required processes, and necessary reports. Focus and FWISD held the Specialty Group meetings in January – February of 2013. 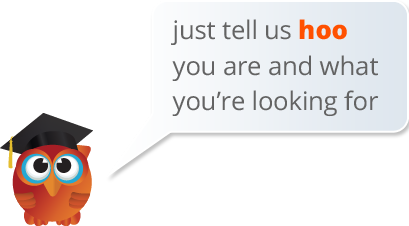 Together, the teams created over 40 custom fields that the legacy system could not track. For example, the Guidance Counselor Group requested a field to track first generation college students. Creating the field in Focus was simple, and it met a guidance need that could not be met for several years in the legacy SIS. The team also eliminated the need for several third-party systems such as Filemaker, SharePoint, Access, Excel, and other paper systems by building forms, letters, electronic signatures, and workflows in Focus. In order to ensure timely scheduling of all students, Focus built reports to monitor how far along the schools were in the process. By the time summer came, all students were properly scheduled allowing faulty and staff to focus on other areas of the implementation. Prior to going live with the SIS, the FWISD school board wanted to guarantee that all users in the district were properly equipped with the knowledge of how to navigate the system. 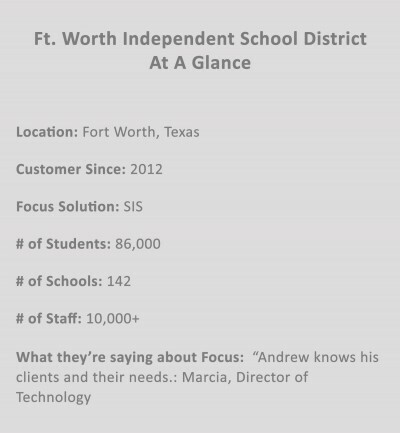 Training sessions were tailored for each of Fort Worth’s various users – administrators, the Education Technology team, teachers, and everyone in between. Focus used its highly specialized training sessions, which included webinar sessions, on-line curriculum with end of session evaluations, and site-based hands-on training. These sessions were followed by a final evaluation created to demonstrate mastery on the new system. Eight short months later, the SIS was live, the scheduling was done, and all staff and faculty had proven their knowledge of the SIS. It was a team effort between FWISD and Focus that led to the successful implementation of the SIS in record time.